Ken Lawrence founded the Deep South People’s History Project in 1973. Today he studies, collects, and writes about aviation history, air transport, and air mail, which are occasional subjects of his monthly columns in Linn’s Stamp News. William Hazelgrove summarized the premise of his book, Wright Brothers, Wrong Story, (Prometheus Books), in the title of his December 2, 2018, prepublication news release: “We’ve Been Celebrating Two Wright Brothers When We Should Be Celebrating Just One.” By his measure, only Wilbur Wright deserves credit for inventing controlled heavier-than-air powered flight in 1903. Hazelgrove’s hypothesis is emphatically wrong. Wilbur was the more articulate and cerebral of the Wright brothers, while Orville was more reflective and mechanically inclined, but essential contributions of both men made possible the December 17, 1903, flight at Kill Devil Hills that begat practical aviation. Hazelgrove’s briefs for Wilbur and against Orville rely on elisions of facts that contradict his verdict. He resorts to fictional scenes, invented conversations, imaginary soliloquies, and misdirection throughout the book. He connives to prejudice readers by retelling salacious gossip about private indiscretions attributed to Orville, originally published nearly sixty years after they supposedly occurred, which, even if true, had no bearing on Orville’s part in the (much earlier) invention of the airplane. Archived letters and published articles by both Wrights refute Hazelgrove’s story. In a two-page letter dated January 8, 1904, on Wright Cycle Company stationery, Orville Wright gave Carl Dienstbach, American correspondent for the German journal Illustrierte Aëronautische Mittheilungen (Illustrated Aeronautical Correspondence) a first-hand report of the December 17 events. The brothers had taken turns, Orville flying first, Wilbur last, in four flights. The test flights ended when Wilbur crashed on the fourth flight. In order to portray Wilbur as the more skillful pilot, and to diminish the importance of Orville’s iconic first flight, Hazelgrove omits mention of Wilbur’s crash landing. As we were not in a position to undertake a long series of practical experiments to discover a propeller suitable for our machine, it seemed necessary to obtain such a thorough understanding of the theory of its reactions as would enable us to design them from calculation alone. What at first seemed a simple problem became more complex the longer we studied it. With the machine moving forward, the air flying backward, the propellers turning sidewise, and nothing standing still, it seemed impossible to find a starting-point from which to trace the simultaneous reactions. Contemplation of it was confusing. After long arguments, we often found ourselves in the ludicrous position of each having been converted to the other’s side, with no more agreement than when the discussion began. It was not till several months had passed, and every phase of the problem had been thrashed over and over, that the various reactions began to untangle themselves. When once a clear understanding had been obtained, there was no difficulty in designing suitable propellers, with proper diameter, pitch, and area of blade, to meet the requirements of the flyer. Hazelgrove is also wrong about the process the brothers went through to invent movable vertical rudders connected to the wing controls. No historian or biographer disputes that Wilbur’s vision, study, correspondence with aviation experts (Octave Chanute most of all), wind-tunnel experimentation, and glider flights at Kill Devil Hills between 1900 and 1902, solved the initial series of challenges, up to the need to add and test a movable vertical rudder. That invention has been credited to Orville for more than a century. Hazelgrove calls Orville’s contribution a myth (pages 146 and 147), which he says began with the 1943 publication of The Wright Brothers: A Biography Authorized by Orville Wright by Fred C. Kelly. To support his argument, Hazelgrove quotes Wilbur’s deposition in a patent lawsuit, in which he didn’t mention Orville by name (page 149), and Wilbur’s 1903 presentation to the Western Society of Engineers, in which he again did not credit Orville by name (page 157). On those arguments Hazelgrove rests his indictment. If Orville wasn’t responsible for the hinged rudder, he cannot be recognized as a co-inventor of the airplane. The corollary of his logic, however, is that because Orville did originate the idea, which became an essential element of controlled flight (and remains so), Orville must be recognized and honored for his indispensable contribution to the brothers’ invention. In other parts of his book and in his bibliography Hazelgrove has cited the documents that verify Orville’s contribution — Orville’s 1902 diary and Wilbur’s 1915 Aeronautics journal article “The Story of Flight” — so one must draw the conclusion either that he was a careless reader or that he intentionally omitted the pertinent quotations in order to bolster his case against Orville. Hazelgrove also plays fast and loose with the details of the Wrights brothers’ personal lives. He wants his readers to regard Orville in later life as a lying hypocrite, not as the pitiable recluse described in Lawrence Goldstone’s Birdmen: The Wright Brothers, Glenn Curtiss, and the Battle to Control the Skies. To support this contention he relies on a selection of 1990s newspaper columns written by a Dayton local historian that discusses the Wrights brothers’ personal secretary Mabel Beck. One of the columns quotes a source who claimed that as a young boy he had seen Orville Wright kissing Beck. Another column provides vague details of a cache of letters from Wright to Beck that might or might not have existed. Excellent biographies of our aviation pioneers are widely available, most recently The Wright Brothers by David McCullough, published in 2015. 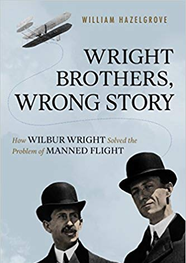 My shelf always has room for authors who present fresh discoveries, perspectives, and insights, but Wright Brothers, Wrong Story fails to satisfy those criteria. I wish I could end by writing something positive about Hazelgrove’s book — some stray Wright brothers episode I had not encountered previously — but I can’t. This is the proverbial “new good book,” whose new parts aren’t good and whose good parts aren’t new. Save your money for a better one.